Scotland’s 2018-19 ski season is expected to start this Saturday, 1st December, the first time it has been possible to predict the start of the Scottish season. Traditionally the country’s five Highland ski areas have not fixed a date but waited for natural snow cover to be adequate to open – sometimes as early as Holloween, other times not until after Christmas and New year. This season however two of the areas, Glencoe and The Lecht, have invested in TechnoAlpin all-weather SnowFactory snow making machines which make snow within the machine before it is spread on the slopes, guaranteeing snow. Both have been making piles of snow this past week to spread on the slopes and there has also been cold weather and some natural snowfall. It seems unlikely either will be able to open large areas of terrain yet but beginner runs and terrain features for freestyle look to be a probability. This was snow falling at Glencoe last week, The Lecht is pictured above on Monday this week. 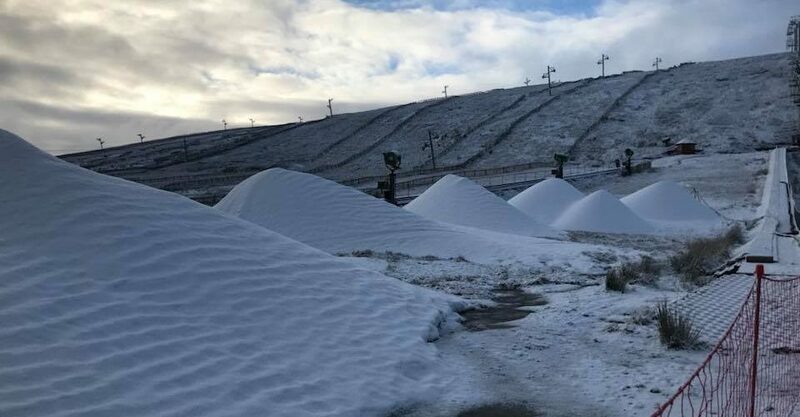 A third Scottish ski area, Cairngorm, is also due to have received a double-sized version of the machine this week and it is expected to start working shortly, despite the centre’s operator going in to administration on Thursday. Ski-Scotland are hoping that the arrival of snow and guaranteed opening of the areas will focus skiers’ minds on purchasing the limited-availability Ski-Scotland All-Areas Season Tickets, a season pass valid at all five Scottish Highland ski areas. There are reported to be still a few available to buy, although stocks are dwindling. The ticket also gives free slope time then discounts at Snow Factor, Scotland’s indoor real snow centre at Braehead, and free access to all of Iceland’s ski areas.